March 26th was History Day1 in the state of Iowa. Throughout the state both middle school and high school students had written and submitted2 original papers3 based on an individual project4 on a topic of their choice. These papers had to focus5 on the theme of “Conflict and conflict resolution6.” That is not an easy topic for young people to understand and write about, but a number of them tried to do so. Don and I both read and evaluated research papers, his from high school students and mine from middle school7 students. We were both impressed with the topics they chose and the sources8 they used. There were about ten places where the students came to discuss their projects, papers etc. One of them was Central College. Don and I went there at 8:15 in the morning to receive instructions9 for the day. Each of us had a partner who also read the same papers we were given, and we had to reach a consensus10 as to the quality of the papers. We also were required to choose the top two11 papers we read; these will eventually12 be placed with the other top papers and read by other judges. Finally, the two best in the state will be chosen and these will be submitted to the national contest13. My partner was Sara Caldwell, a retired middle school social studies teacher. We enjoyed working together and came close14 in our evaluations of the papers. We had to interview15 the students whose papers we read and then tell them how to improve their research, etc. Also we hoped to encourage16 them to participate17 again next year. I’m sure that most of them will. One thing we encouraged all of them to do was to place more reliance18 on books and less on the Web. We also encouraged them to use more primary sources19, sources that actually describe an event as it happened etc. One of my students was a young lady whose father had been a space scientist20 in Russia. He helped launch Sputnik21. It was fascinating22 to have such a first-hand account of the event from the Russian point of view. Her father now teaches engineering at one of our state universities. Sara and I predict many more good research papers from that young lady. Another paper we enjoyed was written by a young baseball player. He hates the steroid problem23 found among many U.S. baseball players, and his love of the so-called “American national sport24” showed along with his research. We both liked his enthusiasm for his topic and his sport. One other thing students could and did do was to give oral presentations on research, or to set up poster displays25. Those were interesting, but I like the papers best. 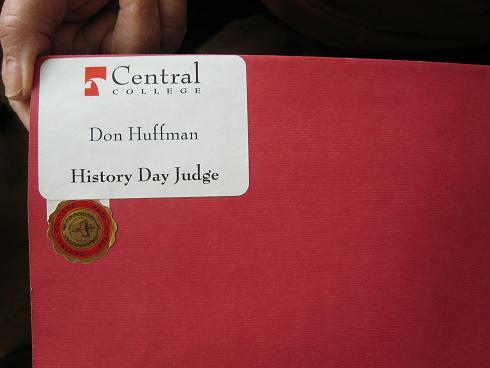 This was the third year I’ve judged History Day papers, and I probably will do so again next year. I think students should be interested in both history and writing. Don agrees. 1. History Day: a day of meetings designated as being devoted to the study of history. In this case students do special projects of historical subjects, write research papers, give talks, etc. (历史日，是开会研究历史的一天。为此学生做专门的以历史为主题的项目，写研究论文，发表演讲等). 2. submitted: handed in for consideration in a contest or for evaluation (递交). 3. original papers: essays written by students themselves (原创的论文). 4. project: an endeavor chosen by an individual to study and/or write and talk about (研究项目). 5. focus: concentrate on a particular area (关注，聚焦). 6. conflict and conflict resolution: disagreement or argument and its solving (争端与争端的解决). 8. sources: places where students found their information - books, original documents, interviews etc. (来源，出处). 9. instructions: advice about how to proceed in a situation (指令). 11. top two: the best two (papers) in this situation (最好的两个). 12. eventually: finally; at last (最后). 14. came close: agreed almost completely in our evaluations (看法很接近). 15. interview: talk with students, ask them questions about their projects etc. (面谈). 17. participate: take part in an activity (参加). 18. to place more reliance: to use more; to give more importance to (更多地依靠，更重视). 19. primary sources: original materials; close to an event (直接来源，第一手资料). 20. space scientist: a scientist who does research in the area of space technology (航天科学家). 21. Sputnik: the first successful space vehicle in Russia (俄罗斯成功发射的第一个人造卫星). 22. fascinating: of great interest (非常有意思). 23. steroid problem: the difficulty caused by the use of steroids by athletes (类固醇问题). 24. American National Sport: a nickname for baseball, attesting to its popularity throughout the American public (美国的国球，垒球的别称). 25. displays: special arrangements of materials for people to look at, read etc. (展览). This entry was posted on Friday, March 20th, 2009 at 10:38 am	and is filed under Education and Learning. You can follow any responses to this entry through the RSS 2.0 feed. You can leave a response, or trackback from your own site.